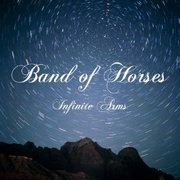 The flawless, epic take on modern Americana that was debut album Everything All The Time gave Band of Horses instant royalty status amongst indie-rock's finest. Then, just twelve short months later, they followed up with Cease To Begin, an immensely strong collection of songs containing a slightly more tender backbone that placed the band on the highway to wider commercial success. Yet, even by album number two founding members - the glue that bound the magic of the debut, if you will - had quit, and the remaining 'Horses had fled the fertile soils of their birthplace in Seattle, Washington to chief songwriter Ben Bridwell and drummer Creighton Barrett's childhood home of South Carolina. Here they adopted a number of local country and folk musicians and began to reinvent themselves. But, even as a live force playing their own back catalogue on the latter end of the Cease To Begin tour, the raw energy of the early years (both live and on record) was absent. The band seemed to be taking stock of their future sound and preparing for an alternative long-term canter. So it's perhaps unsurprising that, three years on, Infinite Arms is the work of an entirely different beast. Even for a band with an infamously tumultuous history, Infinite Arms now screams uncertainty. Firstly, musical advisor and professional yardstick, long-term producer Phil Ek, has gone. As have the solid independent roots of the bands label Sub Pop that left the band - voluntarily - to finance the album sessions themselves (although recently they've signed to major label Sony for its release). Gone also are the oodles of reverb that became a staple customary ingredient of any 'Horses track. However, the single biggest change of all is front man Ben Bridwell, who no longer acts as sole writing force. Infinite Arms actually includes original creations from each member of this five strong line-up. The result is an unbalanced, yet interestingly diverse collection. However, from the first note of the grandiose strings, which sound more like a ropey synthesizer line, on twee opener 'Factory' it's evident that these new influences are not always positive. The band's early informants who included indie-rock heavyweights Built To Spill and Neil Young's Crazy Horse have largely been laid to rest. Infinite Arms picks up where Cease To Begin left off: with a mellower acoustic backbone. Yet, thankfully, for as much as they've lost, they've discovered too. On Infinite Arms a soul has been unearthed; you can hear it in the groove. The electrifying and grand rock moves of debut Everything All The Time have been replaced by radio-friendly slices of 'three-minute-thirty' alt-rock in the vein of Wilco, such as on the clinical 'Compliments' or the downright terrible 'Northwest Apartment'. But – and this is a considerable 'but' - on 'Blue Beard'( an understated song written by bassist Bill Reynolds that builds on echoed vocals to a crescendo of hazy disco soul), it feels like they have beaten Bon Iver to their new signature sound. Or the following track 'Way Back Home' and the earlier, downright grooving, 'Laredo'; songs which tap into that vein of beautifully raw tales of sorrow based around American geography that we have come to expect – both highlights that remain cemented inside the skull. Maybe the contender for biggest surprise comes completely out of nowhere on the uncharacteristically upbeat, almost doo-wop styled 'Dilly'. By this point it seems clear that what is missing is a strong, confident guitar player. Without the walls of guitar, melodies may shine brightly, but tracks ultimately end up sounding uncharacteristically sparse at times. Yet there are new moods, exploring lap steel, specifically southern country for the first time. But still, some of the most captivating hooks found on the record come courtesy of Bridwell in ballad mode, who delivers slow burning slices of beautiful melody akin to Cease To Begin's 'The General Specific; on the albums atypically reverb-laden title track and the acoustically strummed “For Annabelle” with delayed shards of echoing electric guitar, an ode to his baby daughter. So, it's official: Band of Horses doesn't sound like the band you've come to love any longer. But, while Infinite Arms does lack the epic, joyous anthemic gold of their debut, it still holds oodles of subtle gems, a reflective, soulful, cerebrally quiet album. Yet, as closing track 'Neighbour' – reminiscent of a Joe Cocker number - runs past the five minute mark refusing to die with a further minute of noodling still to go, it's clear that Band of Horses have their sights set on a different type of epic: arenas, bowls and stadiums across the globe.